Governor Abiola Ajimobi of Oyo State on Friday warned members of his ruling All Progressives Congress (APC), and other supporters of the party to desist from brooding over what he described as “questionable loss” of the party in the last general elections. 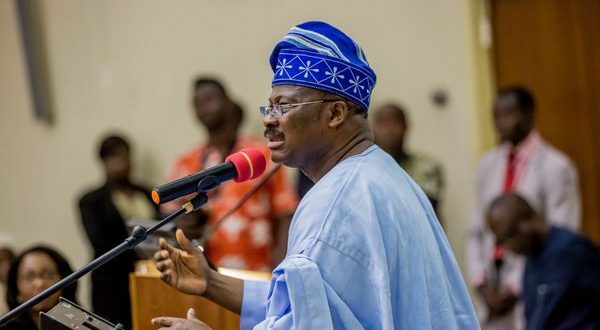 Ajimobi gave this warning while addressing guests at a thanksgiving service to mark the 60th birthday of his wife, Mrs Florence Ajimobi, held at the Government House, Ibadan. At the event were: Wife of the Vice President of Nigeria, Mrs Dolapo Osinbajo; Wife of Ekiti State governor, Erelu Bisi Fayemi; her Imo State counterpart, Mrs Nkechi Okorocha; Wife of Ogun State Governor-elect, Mrs Bamidele Abiodun; and Wife of the immediate past governor of Osun State, Mrs Sherifat Aregbesola. Ajimobi who maintained that he had no reason to regret or worry over his failed senatorial bid and his unsuccessful attempt to hand over to a successor from his party, APC, therefore, told supporters of the party that “there is no cause for regrets”. Ajimobi, said God’s kindness made it possible for him to break the second term jinx and recorded many unprecedented feats, saying he had no reason to regret over his senatorial election loss, saying that God had been merciful and kind to him to use him to rewrite the history of the state for good. Ajimobi said that he, therefore, had no reason to regret or worry over his failed senatorial bid and his unsuccessful attempt to hand over to a successor from his party, the All Progressives Congress. He said, “God has been kind to me for making it possible for me to break the second term jinx, and in the last eight years, it is on record that we recorded so many unprecedented feats for which posterity and history makers will be kind to us. Ajimobi added that her wife’s generosity, philanthropic gestures and warmth had endeared her to people from every stratum of the society who daily describe her in glowing terms and honorifics. He said, “The love I have for my wife is because she is an epitome of pure love; she’s always giving without expecting anything in return; she’s very loving, accommodating, caring, generous, and she has the rare gift of keeping old and new friends, including school mates of over 40 years. Mrs Osinbajo while speaking said Mrs. Ajimobi’s humility, kindness and generosity were virtues that were hard to come by these days, adding that she had shown good example of what Godliness was all about. “I’m here because of the love Mrs Ajimobi exhibits. I’m here to celebrate you because you are so full of love. It’s very rare these days to find people with attributes that are worthy of emulation. I’m here because you have shown that it is possible to be dedicated and be committed to the work of God even when you are in leadership position. The celebrant, said looking back, she believed she had so many reasons to be grateful to God for taking her thus far. She said, “My dear husband, I thank God for making our path to cross. You have been a loving, kind, accommodating, generous, understanding, supportive husband, father and grandfather. No matter what detractors may say, you have laid a solid foundation for the modern Oyo State. Posterity will vindicate you as a man who met Oyo State in rubbles and took it to an enviable height.